An article about ice velocity mapped by ENVEO for glaciers in Greenland using radar satellite data was online published at the website of the Wirtschaftsstandort Österreich. Link to article (in german). ENVEO generated the first nearly complete ice velocity map for Greenland from the new Sentinel-1 SAR data. ENVEO presented the first results at the FRINGE 2015 Workshop (Presentation), and a publication on new opportunities for ice sheet observations using Sentinel-1 data in the Journal Remote Sensing (Nagler et al., 2015) is currently in press. 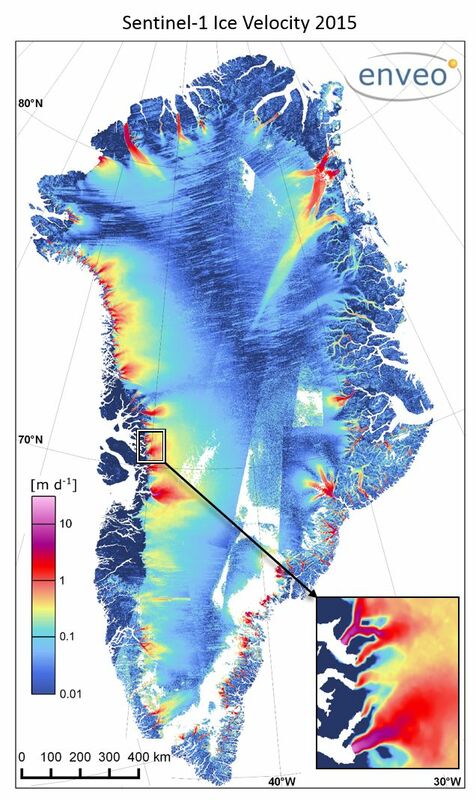 ENVEO mapped ice velocity from TanDEM-X SAR data as contribution to a new study on amplified ice motion on glaciers in West-Greenland due to late-summer cyclonic rainfall. The results were recently published in Nature Geoscience (Doyle et al., 2015: Amplified melt and flow of the Greenland ice sheet driven by late-summer cyclonic rainfall.). The national newspapers ORF and the Austrian communication network for future topics APA-Science (Austrian Press Agency) published a summary of these research results to inform the interested general public. Link to ORF article (in german). Link to APA-Science article (in german). Within the frame of the SnowPEX project the 2nd International Satellite Snow Product Intercomparison Workshop (ISSPI) will take place from 14 - 16 September 2015 at University Memorial Center (UMC), Main Campus, Colorado University Boulder, Boulder, Colorado, USA. ENVEO is organizer and chair of the scientific committee of the 2nd ISSPI Workshop. In the 1st International Satellite Snow Products Intercomparison Workshop, held at NOAA, Maryland, in July 2014, the community discussed and agreed on methods and protocols for intercomparison of products and their validation using reference data sets from various environments and surface types around the world. Overview and status on products and reference data sets are accessible at http://snowpex.enveo.at. The 2nd International Workshop on Satellite Snow Products Intercomparison aims to present and discuss the current status of the snow products validation and intercomparison, to check the trend analysis and to elaborate guidelines for quantifying uncertainty estimates. Registration is open until 31 July 2015. Participation at the workshop is free of charge. Online registration at registration page. More Information can be found at the SnowPEX website: http://calvalportal.ceos.org/projects/snowpex. An ESA story about the results of the field campaign AlpTomoSAR is available here. The airborne campaign is based on an innovative radar system using a new measurement technique for retrieving 3D information by two radar instruments in tandem. At the same time of the flights teams of ENVEO and the University of Heidelberg, Germany, were on the glaciated test site Mittelbergferner in Austria, making field measurements for evaluating the airborne based measurements. This campaign supports the development of the Saocom Companion Satellite (Saocom-CS), a joint mission of ESA and Argentina.